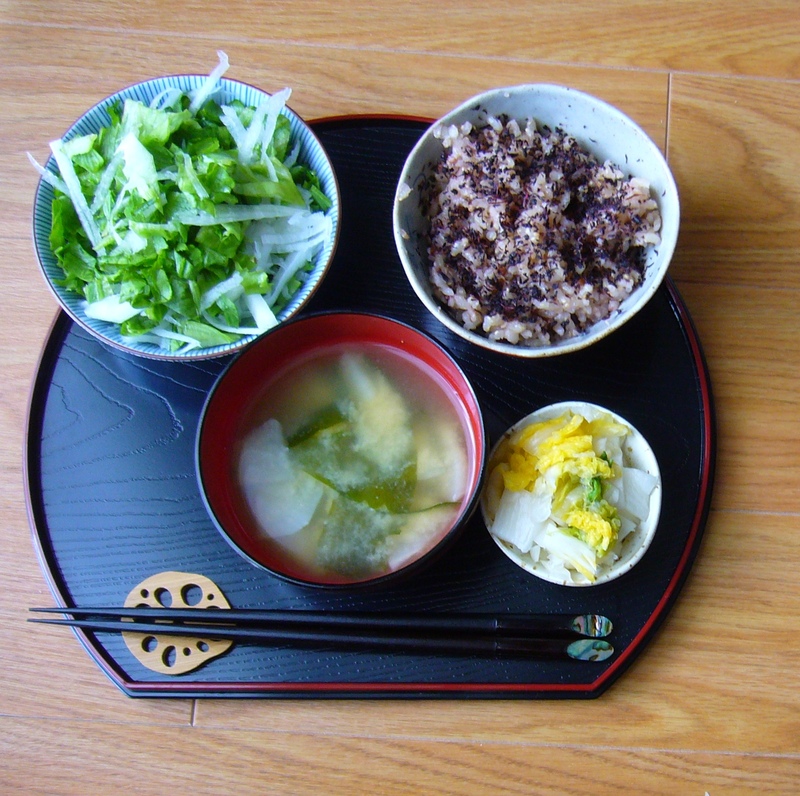 This entry was posted in Food, Japan, Recipe and tagged Daily life, Food and drinks, Guide, Home cooking, Household, How to, Impressions of daily life, Japanese culture, Japanese food, Miso, Recipe, recipe for miso soup by Haruko-chan. Bookmark the permalink. 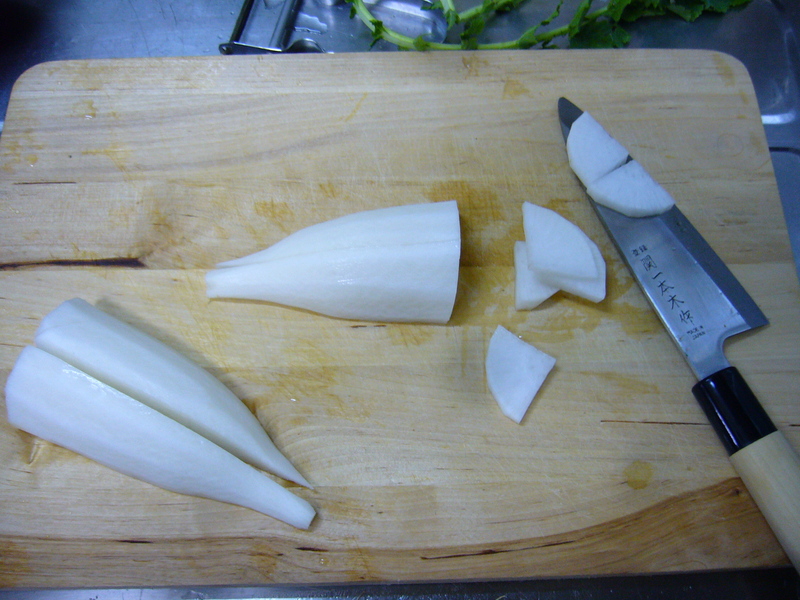 here in all countries in asia, we have our own version of ‘miso’ for cooking. i like miso as much as i like other asian countries’ fermented soy bean paste. 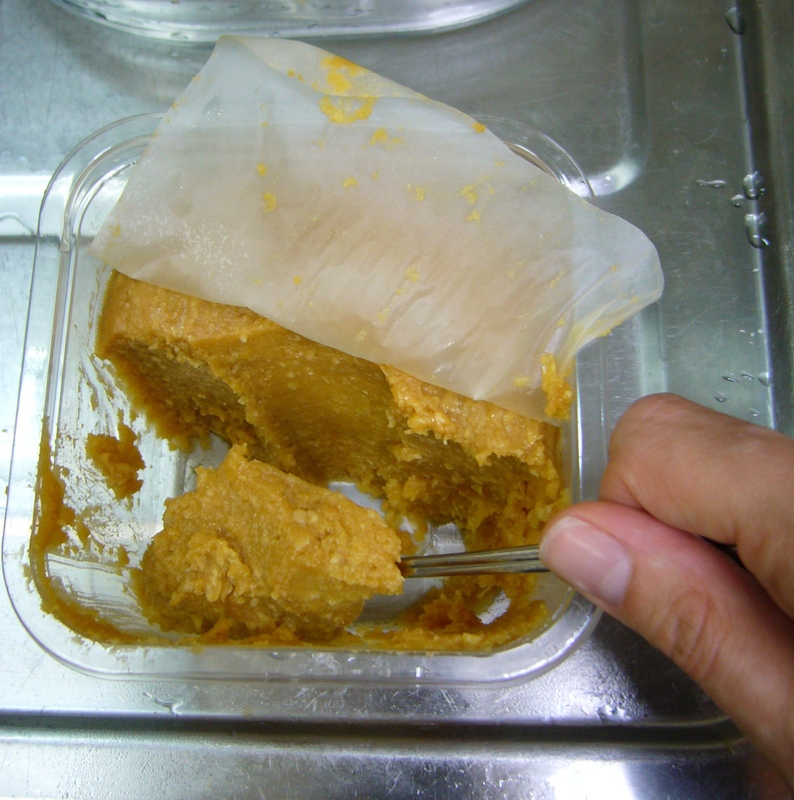 having tried various kinds of miso in japan and the fermented soy bean paste in other asian countries, i can safely say that japan has the mildest fermented soy bean paste, both in saltiness and aroma. I didn’t know other countries use fermented soy bean paste as well. Could you tell me more about the soybean paste in your country? What is it called? How is it used? What does it taste like? unlike miso, most fermented soybean paste in southeast asia are stronger in flavor and smell. mostly used as seasoning for cooking dishes, not for soup. I love this blog, my family and I are heading off to Japan next month and I’m a little nervous. Your style is helping me relax and feel more confident with our plans. I absolutely loved living in Japan and am a little jealous of you because you are moving there 🙂 In my experience, Japanese people are generous and welcoming. My main advice for being comfortable in Japan is to keep an open mind to cultural differences. After that, the rest should take care of itself. I hope you have a wonderful time! Thank you so much for your response. I am open to others, I am a bit worried about making fopas and accidently offending someone. It does help to read up about Japanese culture and customs before you go. In unknown situations I usually hold back a little and take my cues from the people around me. In my experience, as long as you are clearly trying your best to be respectful, Japanese people will be pretty lenient toward foreigners who don’t know the rules. If someone does get angry at you, the best way to difuse the situation is to apoligize and bow profusely, even if you don’t know what you did wrong. It would be great if you could find a Japanese friend to confide in and ask all the awkward questions about cultural misunderstandings. That really helped me during my stay in Japan. I have tried to put a few tips and tricks together in the section of this blog titled ‘Japan guide’: https://thejapans.wordpress.com/gaijin-guide/. I hope they can be of help to you. Please feel free to contact me if you have any more questions. Good luck! p.s. Akamiso is the best! Whenever I have taken foreign visitors to eat akamiso dishes in famous Nagoya restaurants, like akamiso tonkatsu at Yabaton or soba with akamiso, they didn’t seem to like it at all 😦 I think they found the taste to be too strong. Their loss I guess. I have been following your blog for a while and i enjoy it. 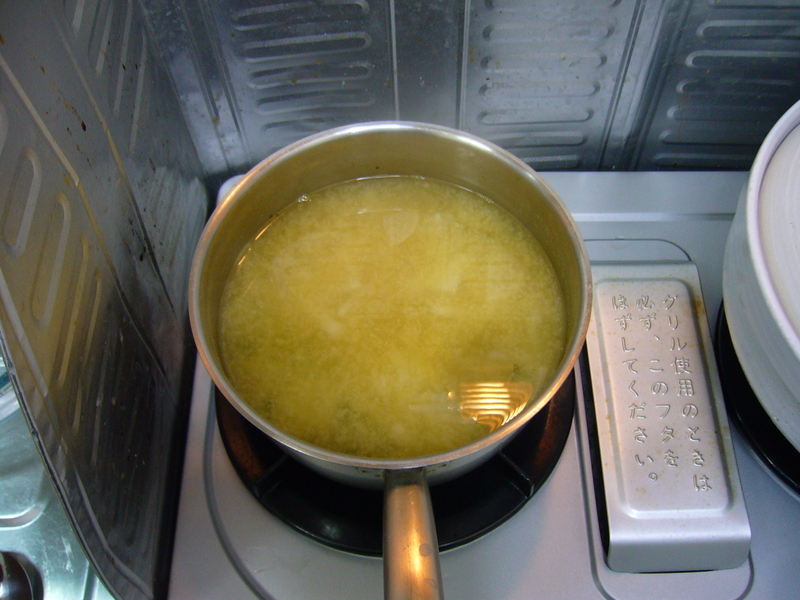 The miso soup looks delicious. Make we wonder is there any Japanese take-outs near my place. I’m so glad you like my blog 🙂 Thanks for taking the time to comment! I love getting to know new readers. Good luck on your quest for Japanese take-outs. I think it’s a good thing there are none near my place or I would eat there every day and spend a fortune. I learned to use the strainer from a Japanese friend 🙂 Is it easy to find miso around where you live? The soup is intriguing. Thanks for the info, Haruko-chan. 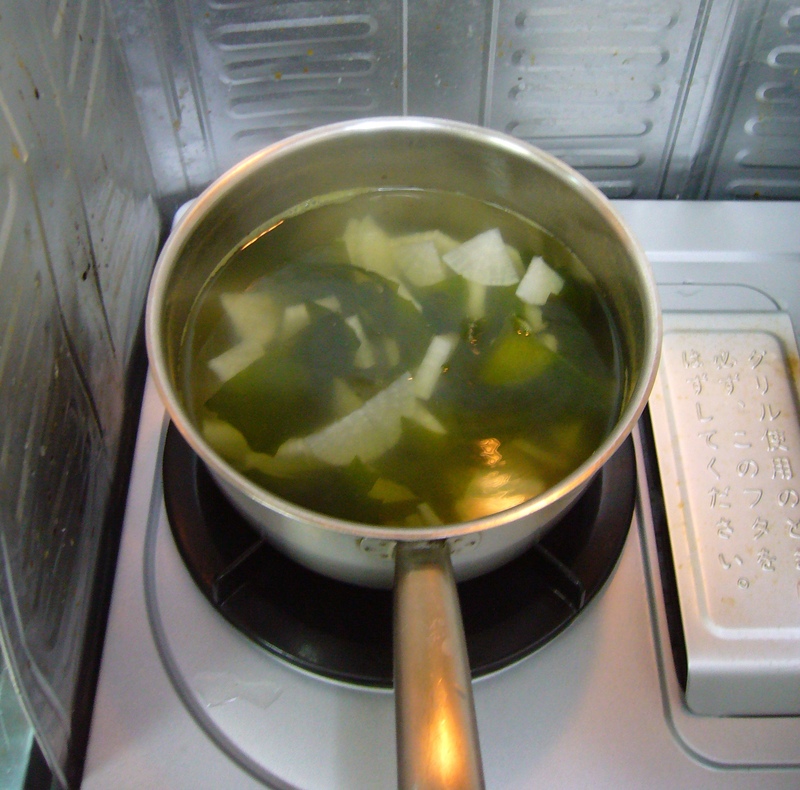 I love making miso soup! 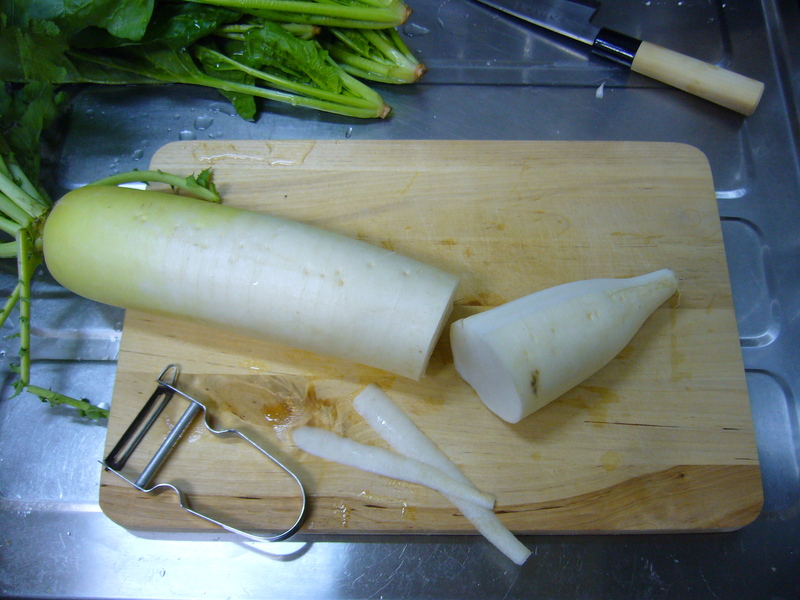 I haven’t tried it with daikon though- I’ll need to give it a shot soon! Every year my friend hosts a miso-making (yes, the miso itself from scratch) class/gathering at an izakaya in Shibuya. I have never participated but the taste of your homemade miso must be something. That miso making party looks like a lot of fun! I wonder if something like that exists in Belgium. 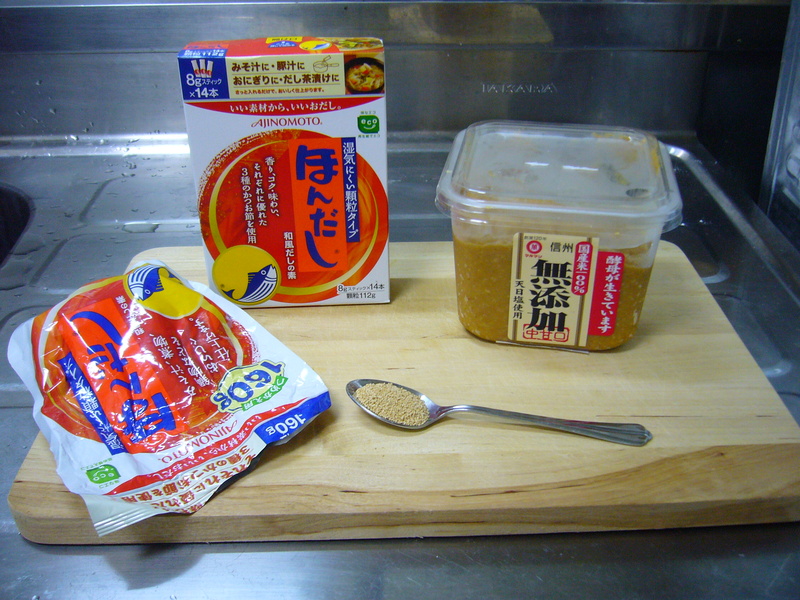 I once had the privilige to taste homemade miso in Japan that was made by the family of my tea teacher. So good! You could try visiting the guy and convince him to hold a miso-making as well as a tasting party when it’s ready to be used. He will have more customers for his veggies that way perhaps?? Sorry, I should have explained. He is a Japanese living in Tubize outside of Brussels, running a farm, and growing organic Japanese vegetables. You should definitely visit!! Thanks for another well presented post. 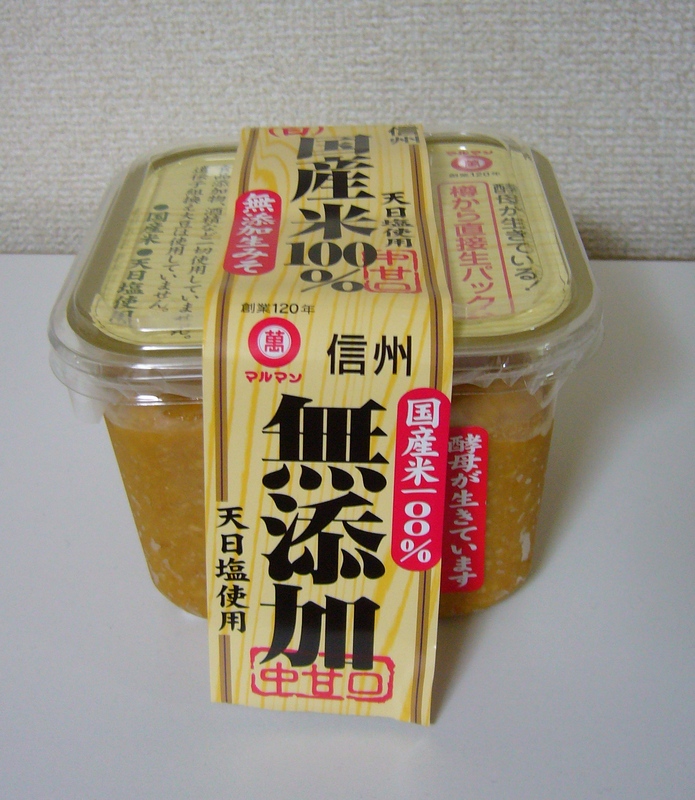 I buy my miso in a natural foods store. There are a few good organic brands. I live in Byron Shire, NSW, Australia. It’s a very alternative lifestyle region. Sometimes someone gets ambitious and makes miso to sell locally. That is a real treat. I use it to flavour many soup style dishes. I just mix in a tablespoon at the end of the cooking. I also spread it on buttered toast sometimes for a savoury snack. It’s a very nutritious food. When I’m I’ll, it’s an excellent way to get nutrition as a simple broth. I prefer the mugi miso but each type has it’s own lovely flavour. 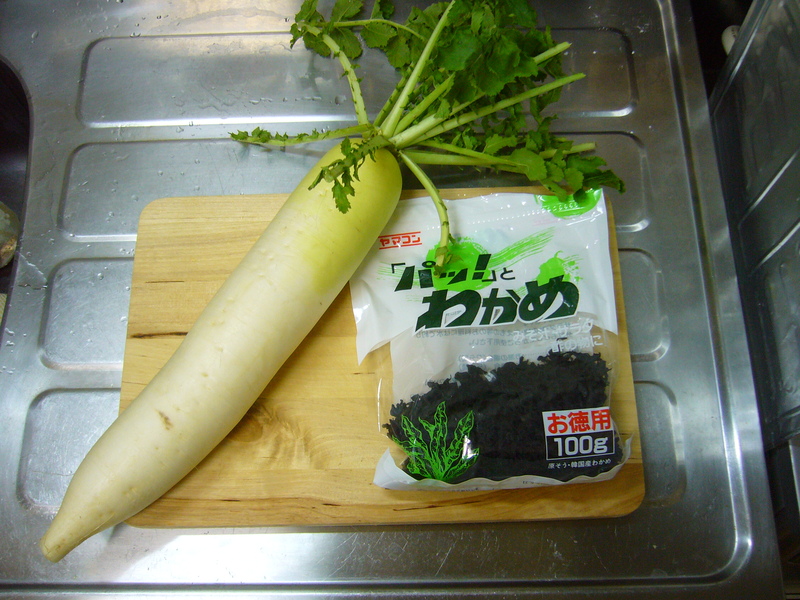 I bought a very nice white miso paste in the Asian supermarket Sun Wa in Antwerp near the Central Station (not the miso in the picture though). 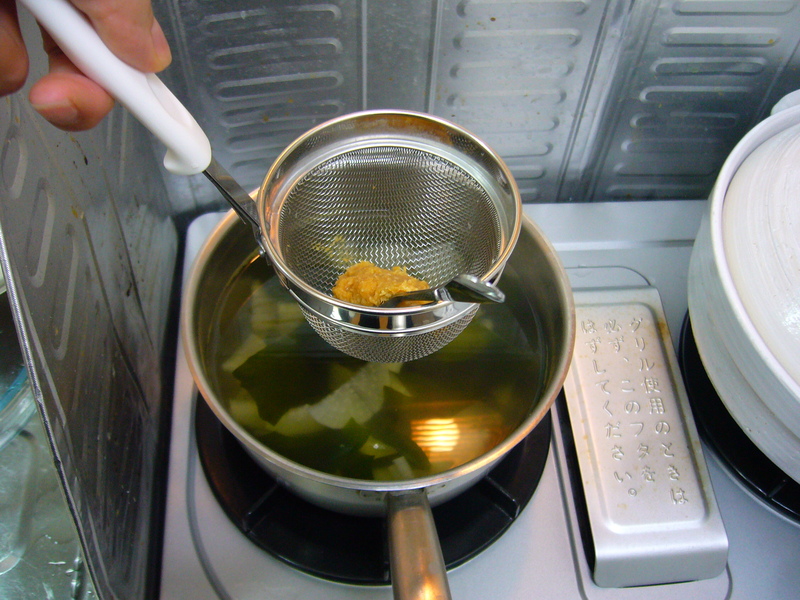 As for the dashi, the same brand of ‘hondashi’ featured in the picture can also be found in Sun Wa (the Japanese ingredients are on the first floor in Sun Wa Antwerp). Of course I imagine you can also find miso and dashi in several other Asian shops in Brussels and other large cities. In Brussels I have heard of three shops that sell Japanese items only: Tagawa (Chaussée de Vleurgat, 119), Kenchan (120 Rue Kelle) and Haruchan (17 Rue des Begonias). I haven’t been there yet but they were recommended to me by Japanese people so I’m sure they will carry good products. Please do ^_^ Let me know how it turned out!